New York — June 2, 2018 … Local and international officials are expected to join over 40,000 marchers from more than 250 organizations, hundreds of thousands of spectators at the 2018 Celebrate Israel Parade on Sunday, June 3, from 11 a.m. to 4 p.m. along Fifth Avenue in Manhattan, from 57 Street to 74 Street. The giant parade will include 15 world-class marching bands and more than 30 floats. Among the dignitaries participating are: Governor Andrew Cuomo; Mayor Bill de Blasio; New York State Comptroller Tom DiNapoli; New York City Public Advocate Letitia James; City Council Speaker Corey Johnson and Members of the City Council; Queens Borough President Melinda Katz; Bronx District Attorney Darcel Clark; U.S. Representatives, Carolyn Maloney and Dan Donovan; Senators Joseph Addabbo, Phil Boyle, Leroy Comrie, Brad Hoylman, and Liz Krueger; Assembly Members Ed Braunstein, Steven Cymbrowitz, Jeffrey Dinowitz, Anthony D’Urso, Walter Mosley, Helene Weinstein, and David Weprin; Consul General of Israel in New York Amb. Dani Dayan; Minister of Culture and Sport of Israel Miri Regev (Likud); Minister of Science, Technology, and Space of Israel Ofir Akunis (Likuh); Israeli Knesset Members Shuli Mualem (Bait Yehudi), MK Oded Furer (Israel Beitenu), MK Yoel Hasson (Zion Camp), and MK Nurit Koren (Likud); Director General of the Ministry of Culture of Israel Yossi Sharabi; Adviser to the Director General of Knesset Vadim Braverman; and Knesset Staff Member Yuval Raz. Grand Marshals Dina and Jonathan Leader and Honorary Grand Marshals, including actor, childhood icon and Birthright Israel alum Jonathan Lipnicki, TV personality Siggy Flicker, world-renowned and autodidact Chef Eyal Shani, singer and entertainer Lipa Schmeltzer, and host of the Unorthodox Podcast, Liel Leibovitz. Performers at this year’s parade include Ninet Tayeb, Omri Anghel, Kosha Dillz, Yarden Klayman, Six13, SOULFARM, and Milk and Honeys. 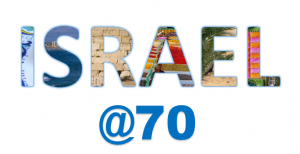 This year’s creative theme for marching groups and floats is “70 and Sababa (70 & Awesome)!” in honor of the 70th Anniversary of Israel. For the latest information on the 53 annual Israel Parade, please visit the Parade website at celebrateisraelny.org, follow us on Twitter,@celebrateisrael, using #TogetherOnFifth, visit us on our Facebook page, Celebrate Israel Parade and subscribe to our YouTube Channel: youtube.com/celebrateisraelny. The Israel 70th birthday celebration continues with a big block party in New York City’s Times Square Sunday night. The event sponsored by the Consulate General of Israel in New York and the Ministry of Culture and Sport will feature singer Shiri Maimon and DJ Omri Anghel. The party will begin as Times Square’s famous billboards transform into a homage to Israel’s heritage of innovation and its miraculous first seven decades. Many celebrities including Mayim Bialik, (CBS-TV‘s The Big Bang Theory) will be featured on the famous Times Square screens and will share their enthusiasm for the country. The whole Square area will transform into a giant Israeli block party for New Yorkers, Israelis and international tourists alike to celebrate together. If you can’t be there in person, you can attend virtually. CBN News will be streaming the event on CBNNews.com and on the CBN News Facebook page beginning at 8:00 pm Eastern time Sunday. Join the conversation by following the event using the hashtag #Israel70TimesSquare.